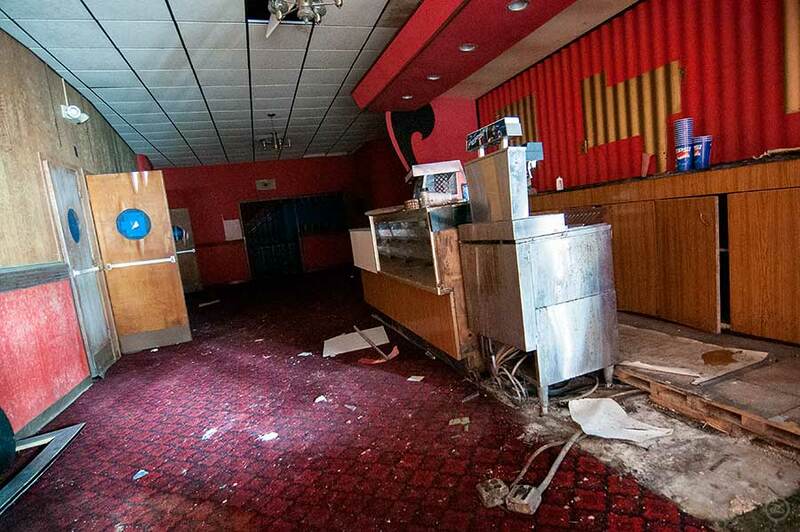 The recent demolition of the Fairmont Theater was sad news. Discovering the Fairmont was one of my favorite theater experiences ever. It had all the elements that make up a perfect ruin exploration: adventure, beauty and mystery. It was fun and scary, left a nice coating of moldy air like flocked wallpaper on the inside of my lungs, and happened completely by accident. 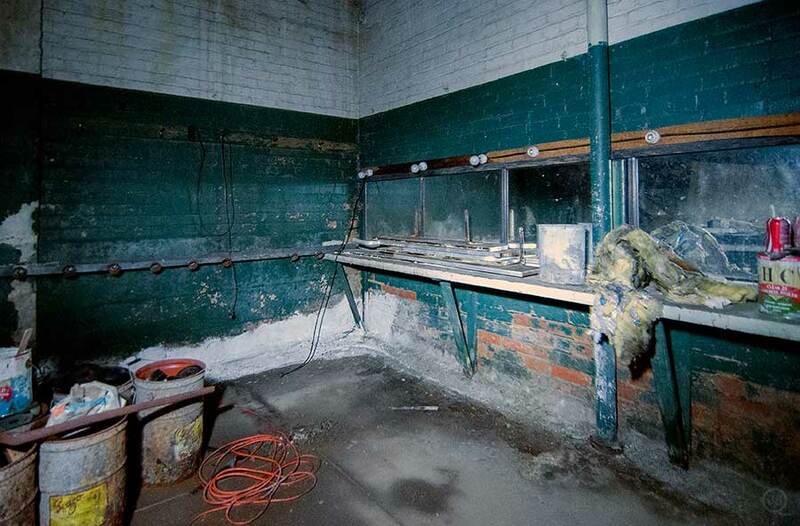 That this place seemed so utterly forgotten – no interior photos online, at all? – made it all the more novel. 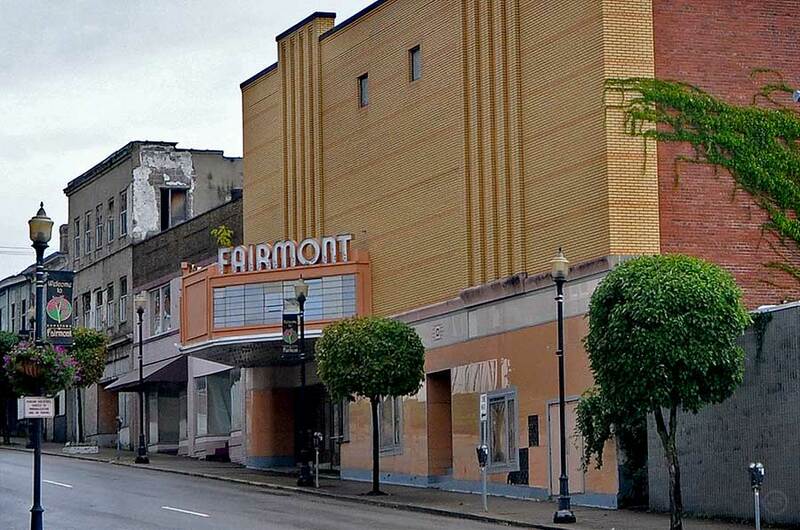 The Fairmont Theater in Fairmont, West Virginia, was built in the 1920s and rebuilt in 1946 after being mostly destroyed in a fire. Designed in an Art Deco style, the main auditorium hosted live performances – Count Basie, Loretta Lynn, Dolly Parton – and was later split into three movie theaters. It was closed in 2007 and torn down in late 2012 to make way for some government development. We know what happens when you build on an ancient Indian burial ground (“The Shining”) and I’m vastly ready for the spanking new state offices on this block to be haunted by a Count Basie melody drifting through room 237. As on every roadtrip through small-town America, we drove along the main streets downtown looking for the customary abandoned playhouse. Sure enough we found the Fairmont with its blank marquee, the promising misty lobby and creepy curtains veiling the ticket booth. To our delight the entire block was in a ramshackle state and turning the corner revealed a wide open basement door into the theater. That door and the glass front of the lobby were the only sources of light in the entire building; the labyrinth of basement rooms was pitch black and the air became progressively heavier. The door had been opened by someone who was possibly still in the building and as always it took a moment to become accustomed to the non-human sounds of the theater, the occasional dripping and rustling, but mostly a voluminous silence. Monks fill cathedrals with chanting as a way to delineate the enclosed space and remind us of our finite state on earth; but sometimes these huge places also contain a kind of packed and heavy silence that seems to want to burst the walls. The basement was buckling under it. 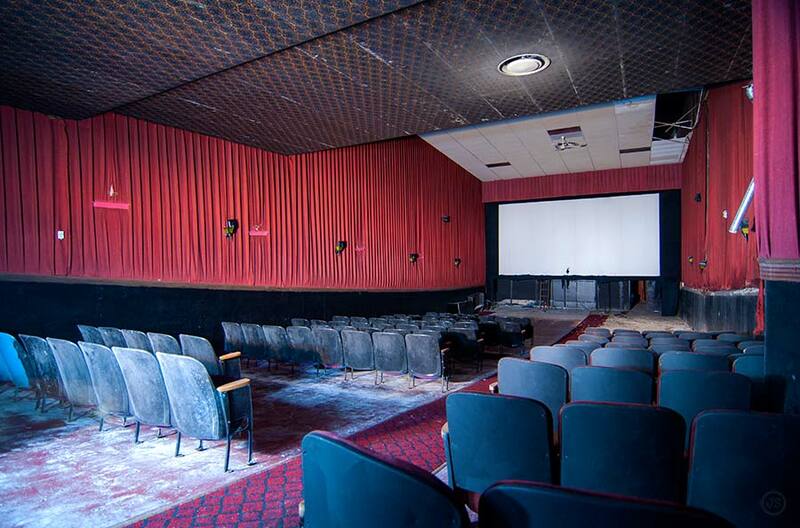 A little staircase led up to a cavernous tomb that seemed to be used for storage; a dark passage towards the front of the building emerged into the first of two ground-floor movie theaters with peeling wallpaper and a white coating of mildew on the vinyl seats. 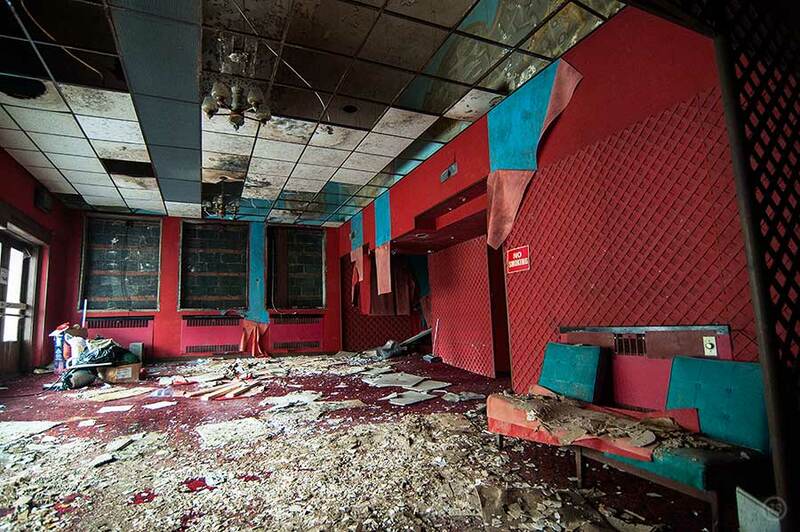 The lobby was welcoming and swampy; upstairs was a wonderful theater with violet walls and a bafflingly unmatching carpet design – not quite as lunar as that of the Overlook Hotel, but a good choice for eerie rolling disco balls. The air was almost unbreathable from all the mold. 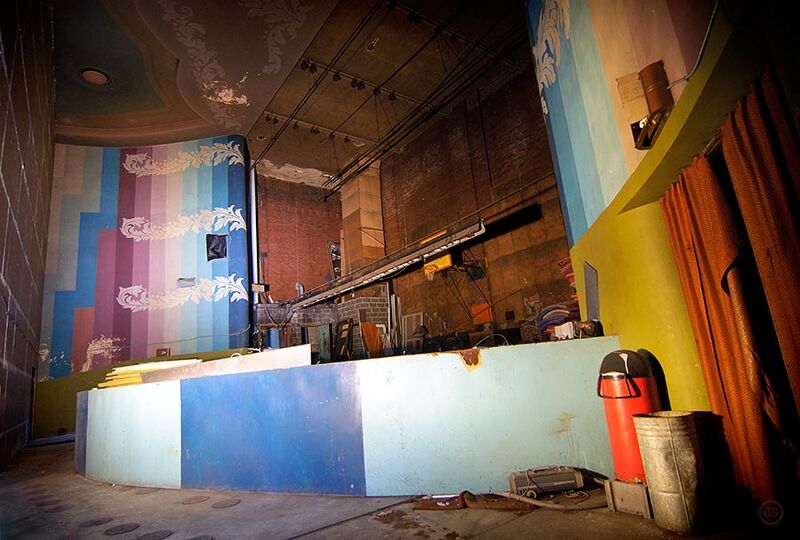 When I made my way back to the basement staircase, I saw that the cavernous tomb at the rear of the building was actually, fantastically, the walled-off stage of the original theater before it was divided. 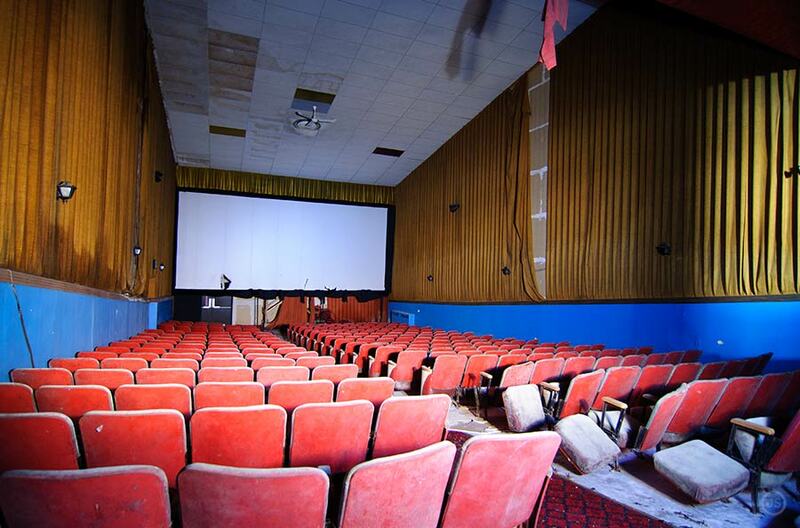 The ceiling and walls still had the art deco paint with stunning colors; traces of the original seats were still visible in the floor. The stage was intact and, like the rest of this space, appeared in excellent shape. There was no decay here, just an overbearing silence. That heavy silence, yes, that wants to burst and that puts all your senses on edge with anticipation. Shining a flashlight around the space was the only indication that time had not stopped entirely in here. 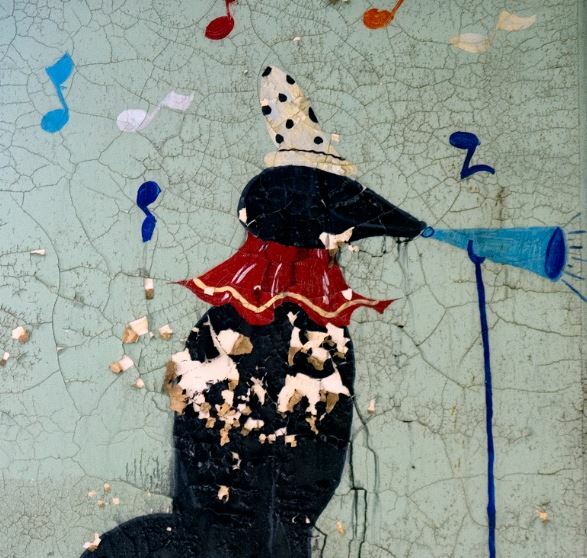 Did any of the theater visitors ever realize what was behind their movie screens? There are walled off stages like tombs all over the country – the lobby converted to a plumbing store, a warehouse, a community center, while behind the drywall, the proscenium gapes open in darkness. And you wonder – what happens in all that silence? Does it ever break? And what happens to the silence when the walls are gone? Here are some snapshots of a silence that no longer exists.